The current American debate over whether or not Dubai Ports World (DPW) should be allowed to purchase the American holdings of Pacific and Orient Steamship Holdings (P&O) would have thrilled Mencken to no end. Nothing entertained him more than seeing Americans making asses of themselves. We’re doing so on several levels, and it is an extremely amusing spectacle for those of us who laugh at human folly. First, a substantial portion of us can’t even get the basic facts right. Last night (22 Feb. 2006) Fox News radio headlined it as “Bush’s plan to give American ports to Dubai.” We shouldn’t expect great accuracy from this extension of the Republican party, but come on, this is utterly wrong on at least three counts. First, this isn’t a Bush administration plan. This is a transaction between two private firms, occurring outside of the U.S. Second, this doesn’t concern the ownership of U.S. ports, nor the guarding of them, both of which remain in U.S. hands. It concerns ownership of the company that manages day-to-day operations of six major U.S. ports, not ownership of the ports. Third, this is not the government of Dubai taking over anything. It is a private company doing so. The government of Dubai is the owner of DPW, but that’s a different thing. DPW is a profit-maximizing company with a strong record as one of the most competent port managers worldwide. DPW is not the UAE government. Third…here’s the real issue everyone is ignoring. Given us Americans’ proclivities for irresponsible finance, the United States have little choice but to accept foreign investment in our country. The case at hand case isn’t the best example of this, since it is simply a changing of foreign hands, not a new transfer from American hands. Still, the point is being raised, “why are we selling our country to foreigners?” To put it simply, we’ve decided to do this. Americans are not savers, on net. We borrow like crazy so that we can consume more than we earn. Some of us save, though, and these savings are about equal to what we borrow, so on net, we’re not saving, we’re even. To understand this issue requires some thinking, as opposed to judging a company on the basis of the skin color or religion of the owners. Since condemning people on the basis of race and religion is a popular pastime, and understanding economics is not, I expect that the debate on this issue will remain incoherent and irrelevant. But here are the facts. Much of the “third world” is finally starting to experience booming economic growth. These non-white non-Christian people are going to be diversifying into the developed world. America’s financial irresponsibility makes us dependent on their investments, whether we know it or not. And while foreigners have been happy buying U.S. gov’t bonds for a while now, these are, as G.W. Bush puts it in the Social Security context, just paper IOUs. So foreigners will increasingly purchase assets in the U.S. Americans do not currently have the self-discipline needed to face the government spending cuts, tax increases, and net household saving that could reverse the trend. So we continue to sell our assets to pay for our spending, all the while whining about the dreaded A-rabs and Chinamen to whom we’re selling them. Mencken would have loved this show. In response to the Danish cartoons, an Iranian newspaper announced a holocaust cartoon contest. In response to the Iranian holocaust cartoon contest, an Israeli professional cartoonist has announced an anti-Semitic cartoon contest. I find the site amusing (of course, I may be the only person in the world to have publicly confessed to finding the Danish cartoons amusing, too). I guess this is a real contest, so maybe we'll have another set of politically incorrect cartoons soon. I long for the day when torture is treated as more outrageous than are non-pc cartoons. There's nothing like drawing grand inferences from a few noisy data...for leading ones self astray. For those who suppose that violence by radical Islamists means that Islam is inherently totalitarian, here are a few good counterexamples that sink the thesis. The first strictly concerns the Danish cartoon affair. The other two are more general. All are thoughtful and worth a look. Is Islam inherently totalitarian? Is the initiation of violence against peaceful people inherent in Islam? Is totalitarianism and the initiation of aggressive violence against peaceful people inherent in some forms of Islam? The texts of revealed religions are obscure and vague. Even taken literally, they are open to such extremes of interpretation that one may reasonably claim them to be compatible with ethical standards that range from pure libertarianism to complete totalitarianism. No revealed religion will survive a rigorous test for logical consistency or evidence (see George Smith’s “Atheism: The Case Against God” and Thomas Paine’s “The Age of Reason”). Regardless, these are obviously important sources for humans’ beliefs. And given that we don’t reject them as illogical and empirically falsified, i.e. given that we pay attention to what they say, they can be reasonably interpreted to include a wide range of beliefs. Consider Christianity, for example. Some who take the Bible literally believe that all of the Old Testament laws should be enforced – e.g. gays and nonbelievers stoned to death, textiles that use mixed fibers banned, etc. Do a Google search on Dominion Theology if you doubt anyone would go that far. I’ve met plenty of Christians who have told me that gays, pagans, atheists, and similar non-believers should be put to death. Simultaneously, people who take the Bible literally can be the most civilized, tolerant people imaginable. I knew a woman, a Christian fundamentalist, who took the Bible completely literally. She knew I am an atheist, but treated me with the greatest kindness and respect, was a good friend, and we had great debates on religion. I am sure she saw her friendship with me as completely compatible with her religion. I can’t imagine her stoning me, nor stoning the open lesbians and bisexual women on the women’s basketball team she coached (one of them told me they all thought she was a really fine person and friend). The same goes for Islam. I have tried reading the Quran, and can’t make any sense of it. (Supposedly it must be read in Arabic, which is worse than Greek to me, but as Thomas Paine pointed out, the idea that God is limited by the constraints of human language is, well, genuine blasphemy.) But I have met a number of well-read, well-educated, thoughtful Muslims, and it is obvious to me from their wide variety of Islams that the Quran is every bit as obscure and open-to-interpretation as the Bible. Consider Dean Ahmad, an American of Arab descent, Ph.D. in Astronomy, and Islamic cleric, and former Secretary of the Libertarian Party of the U.S. While at a conference I had the good fortune to spend an evening talking with him about Islam. He explained to me why, properly understood, Islam is a religion of reason, tolerance, and liberty. Afterwards I read his book “Signs in the Heavens.” While it is written for Muslims, and thus in places obscure to a non-Muslim such as me, it made a case that reminded me of Rose Wilder Lane’s “Discovery of Freedom” and Henry Grady Weaver’s “Mainspring of Human Progress:” real Islam is pro-reason and libertarian. Similarly, Dr. Taras Verakov, a Russian Arabic scholar and convert to Islam (who also happened to be my chess partner when I taught in Moscow) told me that Islam, properly understood, is inherently libertarian, and therefore Muslims should honor America as the society that is as close to ideal as humans have yet been able to come. (I almost felt I was speaking with Ayn Rand when I talked with him, although he was unfamiliar with Rand.) Both Ahmad and Verakov have deep understandings of the Quran and Islam; both are extremely well educated, both have read the Quran in Arabic, and both believe it is fundamentally pro-reason and libertarian. This is the good Islam. It is pro-freedom, pre-reason, and pro-human. Bottom line: there is a libertarian Islam. Simultaneously, there is a perfectly reasonable interpretation of Islam that is utterly incompatible with freedom. I had the good luck a number of years ago to spend an evening discussing religion with a Pakistani economist, a devout Muslim who was head of the Muslim Students’ Organization at Montana State University. He was clearly very devout, and a genuinely honest and moral man. I really like him. And if I had $100,000 in cash that needed safekeeping, I would trust it to him, without hesitation. But I also would trust him to cut off my head if I tried to kiss one of his daughters. I asked him about dating in Pakistan – he assured me that in proper society it isn’t done. “And if a boy and girl did meet, without permission, just to talk?” “Usually their fathers would get together and agree to put both of the children to death. And then they would kill them. The children were immoral, after all.” “And would the fathers get away with this?” “There’s a good chance that they might spend a couple of months in prison, as this is technically illegal. But then they’d go free, it would not be a big deal.” He thought that this was appropriate. His Islam, which he assured me is well-founded in the Koran, is utterly totalitarian and authorizes violence against peaceful people. This Islam, the evil Islam, is very common. How many Muslims demonstrated in protest when Daniel Pearl or Nicholas Berg were beheaded in the name of Islam? How many Muslims demonstrated in protest when fellow Muslims committed mass murder of grade school children in Beslan? How many Muslims demonstrated in protest when a pair of sociopaths from Hamas (may they rot in hell) blew to bits a bunch of teenagers on the Ben-Yehuda mall? Add up all the Muslims who publicly protested these savage murders done in the name of Allah, and you’ll find they are far outnumbered by those who publicly call for the deaths of some European cartoonists and editors. This is evil Islam, and we damn well better confront it, without regard for political correctness or politeness or the feelings of its adherents. Better that we do it now, with cartoons and ridicule, than later with guns and bombs. If you don’t understand that there are Muslims who are seriously working to impose totalitarian Islam on us all, then you have not been paying attention (reading “Foreign Affairs” is sufficient attention). At a practical level, this Islam is the equivalent of Nazism. A contradiction? Sure. Clearly, a large part of the Islam of my Pakistani friend is pure evil. But there’s the part that is good. In my view, he’s a good man, caught in a bad set of ideas. What do I wish for him? Enlightenment, and liberation. I cannot imagine how this could be done, without offending him and shocking the hell out of him. I hope that he sees the Danish cartoons, especially “Stop, stop, we’ve run out of virgins” and “relax folks, it’s just a sketch…” and the turban bomb. These will shock him horribly and offend him. But he’s an intelligent and thoughtful man. I hope that after the initial shock wears off he’ll realize that the world hasn’t collapsed simply because these were published. And then just maybe he will suddenly say “what was I thinking? That could be me, offering a bomb and a scimitar in the name of Islam, rather than the good works I was lecturing that foolish guy in Montana about.” And then, I hope, he will begin to acknowledge liberty. We who are pro-liberty and pro-West must not worry about offending Muslims. We must attack their false ideas and shock the hell out of them. It is preferable to fighting them to the death in a struggle for reason and liberty (which we must do if it comes to it). And we should recognize that Islam is like most broad bodies of human thought: it contains not only falsehoods, but also good things from which we can learn, and some of its adherents are among the best people among us. It may be a war of civilizations, but waged properly, it can be a positive sum game. The Free Muslim Coaltion is speaking out for freedom of expression and against the hysteria, intolerance, and violence that so far appears to be the only reaction from the rest of the Muslim world. I suspect I unfortunately have no Muslim readers, but if I did, here's what I would tell them: By condemning a few mild sketches, and remaining silent on the violence and threats perpetrated by Muslim fanatics, you are simply confirming the common perception that Islam is a religion of intolerance, hate, and aggressive violence. I have argued that this perception is an unfair characterization of Islam, but I find myself wondering -- where are all the tolerant, freedom-loving Muslims? Except for the good people of the FMC, there seems to be no Muslim willing to take a stand for freedom, and to publicly condemn the hysterical and violent reaction of their fellows. Muslims, speak out for freedom and tolerance now -- or convict yourselves by your failure to do so. Difficult to find, but here it is..."Don't grumble Mohammed; we are all caricatured here!" Forget the Jyllens Posten cartoons. Here's an extremely offensive picture of the Prophet Mohammed. Blasphemous, yes? Surely this goes beyond any of the infamous Danish portrayals of Mohammed, portraying him as a pig, of all things! But of course, there's nothing inherent in this the picture that makes it Mohammed, nor blasphemy. It isn't even a pig, but a "piece" of software, a computer graphic that we can interpret as a pig...or as Mohammed...or Jesus...or God...or anything else we choose. In the same way, the J.P. cartoons are not Mohammed, they are sketches that some of us attach meanings to, and it is the meanings we attach to them that offends, not the pictures. The real "offense" of the Jyllens Posten that is being protested in the Muslim world is not blasphemy, it is freedom of thought -- which means, freedom to reject the notion that Mohammed is a sacred figure. The notion is that some ideas aren't open to question, and that to question or challenge must be prohibited. The Muslim world needs to grow up, and fast. All ideas are open to public question, to public scrutiny, and even to public mockery if the someone so chooses. The only proper tests of ideas are logic and empirical evidence, and in order to employ these tests, we need to be able to examine all ideas, without threat of attack by masked gunmen or rampaging mobs or kooks with dynamite strapped to their bellies. The only reason anyone should ever accept any idea -- whether it be Islam, Christianity, Atheism, or anything else -- is that they have been freely convinced, hopefully on the basis of reason and evidence. It's time for Muslims to abandon the feudal era and join the 21st century. For your viewing pleasure, I am also providing a picture of Mohammed's wife. Or maybe this is Eris, Goddess of Liberty. Maybe it's both! What a dreary speech...more big government from the president. There were the repeated assertions that he doesn't need warrants to order searches and wiretaps in violation of the 4th Amendment, and the senseless statements that confused democracy with freedom. After decrying the idea that "the government needs to take a larger role in directing the economy, centralizing more power in Washington and increasing taxes" as "economic retreat," he endorsed expansions of federal programs and power such as the ethanol boondoggle, the "Advanced Energy Initiative," the "American Competitiveness Initiative," and similar foolishness. And while he claims to be cutting taxes at the same time, he isn't -- the spending increases are paid for by borrowing -- this is just taxation deferred to the future. Pundits are too easy on him -- they should expose him as the tyrant and liar he is. 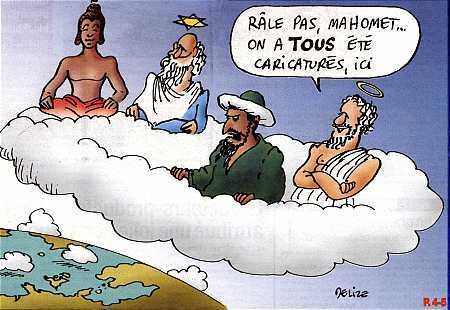 French and German newspapers (France Soir and Die Welt) have now republished the “blasphemous” Danish cartoons, adding to the international uproar. Quite to the contrary, the West, as exemplified by these courageous European newspapers, knows very well what is sacred: the rights of every individual to freedom of expression, including the right to disagree with, and even publicly mock, the foolish ideas of others. It is time for the muslim world in general to learn about the unalienable and sacred rights of the individual, and join the civilized world.